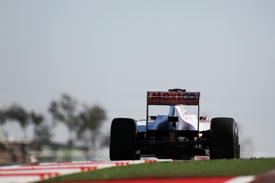 Sauber believes the tyres brought to Austin for the United States Grand Prix are proving too hard for the Austin track. Pirelli has taken the medium and hard tyres for this weekend's race, and that, added to the slippery surface of the brand new Circuit of the Americas, made things difficult for the drivers during Friday practice. "The biggest challenge is to get the tyres to work, as they are definitely too hard for the circuit," said Giampaolo Dall'Ara, Sauber's head of track engineering. Sauber driver Kamui Kobayashi admitted he was struggling to get the tyres to work properly. "I must say I have big warm-up problems with both compounds," said the Japanese, ninth quickest in the second session. "It just doesn't work in qualifying if you need 10 laps to get the tyres to work. We will now go and look for solutions." Team-mate Sergio Perez posted the 14th fastest time. The Mexican was not comfortable with the handling of his Sauber.